Italian watch company Wintex introduced a new collection of watches Vitamin Collection, which consists of a modern and stylish models in colorful hues of the summer trend of 2012. 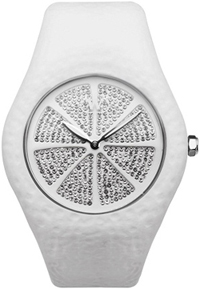 Dynamic and sporty appearance of new products inspired by the forms of citrus fruits. Evidence of this fact is the dial, which is a citrus in the cut. Decorated with crystals Swarovski, the dial is protected by mineral glass. All models have a line of stainless steel and come with rubber straps rich vibrant colors that match the tone with the body clock. New Wintex Vitamin operates on the basis of quartz mechanism. The models presented in white, turquoise, orange, blue, yellow and pink colors. Each color version is released in two versions: with stones Swarovski, adorning the contours of a segment or completely cover the entire surface of the dial. Waterproof model reaches up to 50 meters. Model Wintex Vitamin released in a limited quantity of 360 copies. Buy watches at a price of perhaps 230 euros at the official representatives of the company Wintex.